Roy relates his experience and lessons learned through a three year battle with his wife’s terminal cancer. Invite Roy for a Sunday morning or an entire conference. He will encourage caregivers. He will also help Pastors, family and friends of caregivers better understand how to help and encourage those providing care of the sick, physically/mentally challenged and elderly. 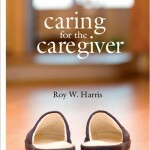 Roy authored a national best selling book titled: Caring For The Caregiver and will make copies available to you at your church or conference. Please click on Contact Roy for Roy’s contact information.